Hiding empty card reader drives from the system! If you have one or more network drives connected as well as you actively use USB devices, Windows on its restart may mount a USB device to the letter of a network drive or vice versa. In this case the network drive will be unavailable or it can be mounted to another drive letter which is inconvenient, when you have program shortcuts to this drive. If you have several external drives, Windows may mount the same drive to different letters on system restart. It might be unuseful, especially if you setup data backup software for this drive. In this case it is convenient to have these drives mounted as folders of your fixed NTFS drive and disable assigning of the letters to the drives. For example you can mount all your external drives to the folder of drive C: - C:\Externals. You can see benefits of this solution from the figure below. 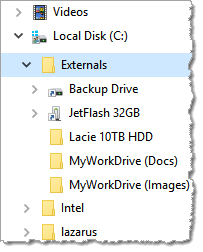 In short, all your external drives will have clear fixed names, as well as you can see which drives are connected at the moment ("Backup Drive", "JetFlash 1 GB") and which not. Enable "Mount drive as a folder" option (see pos. 1) and specify an empty NTFS folder where you want to connect the drive to (you can choose a folder using "..." button). 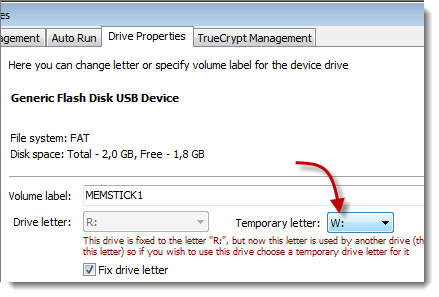 Also you may fully detach the drive letter (see pos. 2). External drives can be mounted only to empty NTFS drive's folder! 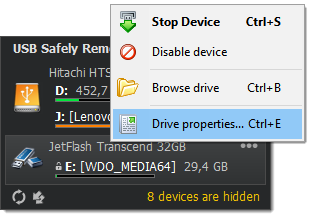 You can change drive letter of a device or even disable it to hide device drive in Explorer. 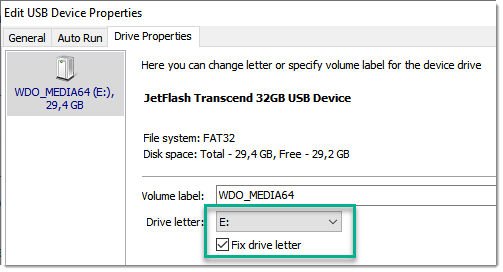 In the "Drive letter" dropdown list choose a needed drive letter. 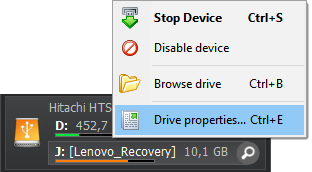 "No" item means that a letter will be disabled for this drive, and you will not see it in Explorer. 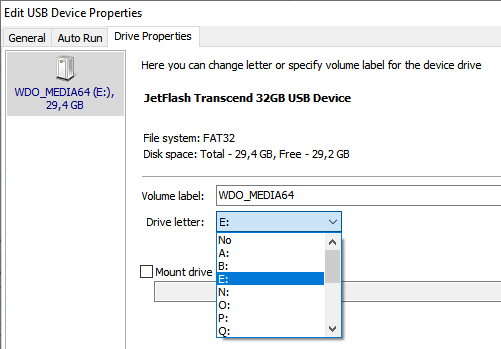 Windows may assign different drive letters to a certain device, so you are not sure what drive letter will have your flash drive on this connection. Usually it's a bit annoying but do not prevent you working. The problem will arise when you need to start non-portable applications from the flash drive or you wish to ask a desktop application to store data to your external drive. 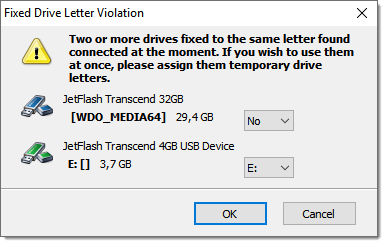 In this case the device must have a fixed drive letter that isn't changed amongst different connections. USB Safely Remove starting from version 4.2 resolves that problem. It allows you to fix drive letter to a device. Just open your device properties, switch "Drive properties" tab, choose required drive letter and check "Fix drive letter". Starting from this moment your device will always stay with this drive letter and no one of other devices will occupy this letter even when your device is not connected. For some scenarios of usage it's required to automatically assign the same drive letter to several external drives on the condition that the user will connect only one of the drives at the same time. For example it might be required for backup purposes when you setup the backup program to do backups to a certain path and wish to backup to a different removable drives. 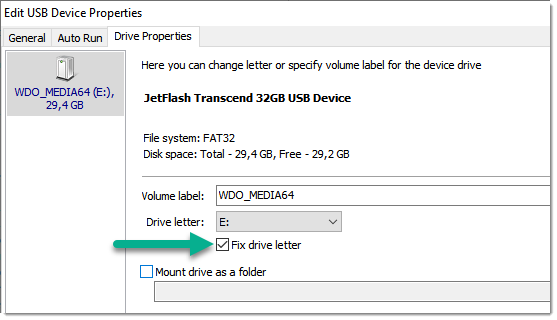 If you connect the drives that are fixed to the same drive letter at the same time, the program assigns a fixed letter to one of these drives and will show you the dialog where it allows you to choose the temporary letters for other drives. Do you have a card reader with several slots? If you said "yes", you would likely use only one memory card at a time, however your card reader creates up to 4 drives in your system. It may be annoying because you are required to spend more time finding the memory card drive among other "empty" card reader drives.